contact you to generate a quote. 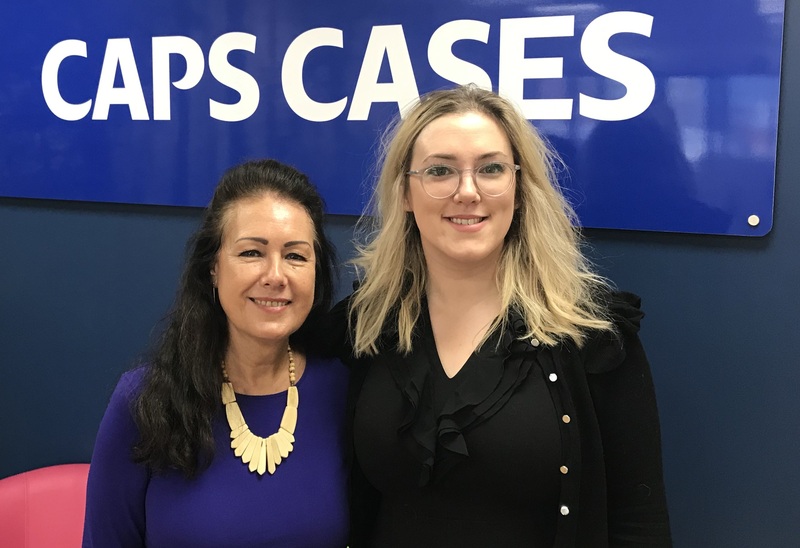 Last month saw the welcome return of two members of the Caps Cases Newmarket team – Hannah Ayers and Gill Bridgman. Hannah has returned to her role in Business Development and Gill is back in the office overseeing general administration duties. Both are settling back in to ‘Caps life’ after a short break to pursue other interests. “We’re really glad to have Gill and Hannah back on board – in fact it feels like they’ve never even been away!” says Trevor Bissett, Managing Director. Welcome back Hannah and Gill! How does it feel to be back at Caps Cases? Hannah: Like I’ve never left. Caps and cardboard feel like home to me! Gill: It’s really good to be back – it’s like coming home. What does your role at Caps involve? Hannah: As a family run business I guess we all prides ourselves in the thought that we can all lend our hand to any task that needs completing. However my main role is the developing new business and growing and maintaining relationships with our existing client base. Gill: I help out on reception and general admin duties such as booking in deliveries and answering the phone etc. Gill: Meeting people and talking to customers. Hannah: Ringing the order bell and visiting customers when the sun is shining. What are you looking forward to most about being back at Caps Cases? Hannah: Being back in the team with everyone and being able to get back out on the road. And the Friday Lunch Club of course! Gill: Catching up with friends at work and customers. What’s been your most interesting or funny experience during your time at Caps? Gill: A Christmas party many years ago, but I don’t think I can go into detail on here! Hannah: I’m not sure there are many stories that can be shared but the most cringe-worthy tale is probably filling up my diesel company car with petrol! Awks! Gill: I love travelling and I read a lot. Hannah: I enjoy dog walking, exercising and gardening. I sound about 75! Hannah: Keeping my three year old daughter and badly behaved Labrador alive! Gill: Still having all my own teeth at the age of 64! Any interesting facts that we should know about you? Hannah: I am the Great Granddaughter of Sir Henry Ayers. Ayers Rock (Uluru) was Named after him. Welcome back Hannah and Gill! As a manufacturer of cardboard boxes, we understand the importance of a reliable and robust shipping and delivery service. The delivery of our products is the final stage in the fulfilment process for our customers, and for some, the most critical. That’s why we take extra special care when planning and carrying out the deliveries of all orders. 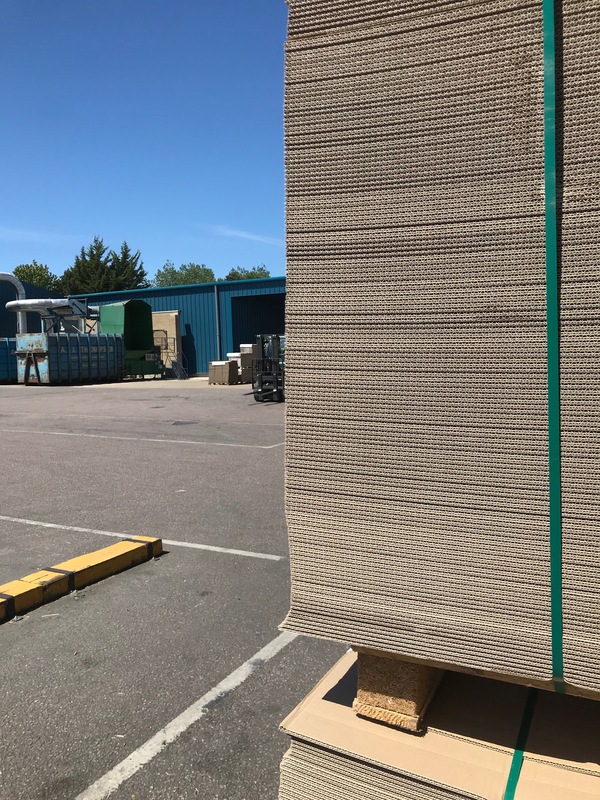 With factories in Suffolk and Glasgow we are able to deliver your corrugated packaging quickly and competitively throughout the UK and into mainland Europe. Caps Cases’ dedicated transport team works tirelessly to ensure that we deliver on an unbranded vehicle suitable for the specific individual needs of each delivery destination. We also utilise a range of vehicle sizes, meaning we can handle deliveries of all sizes across the whole of the UK and our customers can view details of upcoming deliveries on line via the customer portal. 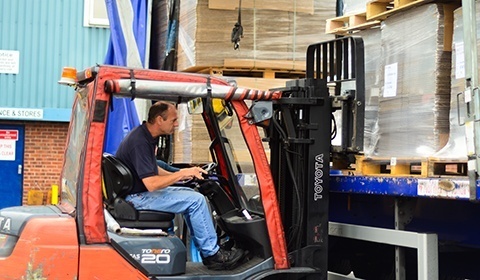 “We take pride in the presentation of every pallet that we deliver and ensure that your goods are always handled with the utmost care,” comments Operations Manager Dave Lochhead. For more information about Caps Cases delivery service or range of products email sales@capscases.co.uk or call us on (01638) 667326. Across the 28 countries of the EU, the recycling rate for paper and cardboard packaging waste has reached 85.8% – the largest of all the packaging materials analysed. The recycling of paper is not a new concept and the UK industry is proud of its recycling heritage that started over 100 years ago. On average, corrugated boxes made in the UK already contain 76% recycled material and many boxes are made from 100% recycled material. Corrugated packaging is very flexible when it comes to disposal, more than 80% is already recycled but it can also be reused, composted or incinerated with energy recovery. In light of the new recycling figures from the EU, we thought it would be an ideal time to take stock of our own carbon footprint and green initiatives. Our environmental responsibility is something we take very seriously at Caps Cases, both as an individual business and as a global industry. That’s why we ensure we do everything possible to minimise our own carbon footprint. 100% of our off-cuts and waste paper is recycled. Our closed loop recycling system captures waste directly from the machines and processes it for recycling. We implement an accurate and precise setup process for each job, therefore minimising the amount of material waste and off-cuts as much as possible. We prefer to use 100% recycled paper and encourage our customers to choose recycled paper when suitable. Pallets are re-used where possible. Our deliveries are grouped where possible to save fuel. We review the energy consumption of both our factories on a regular basis to ensure we maintain a consistent level of performance. All toner cartridges and paper used in our offices is recycled. We encourage all office and canteen waste, such as cans, bottles and plastic cups, to be recycled. Our commitment to the continued challenges of reducing our impact on the planet has become part of our everyday management systems. This is supported by our accreditation to ISO 14001: 2004 for Environmental Management and awareness. You can learn more about corrugated recycling and landfill here. Transporting and storing bottles safely can be notoriously difficult, but not when you have the right packaging for the job. When it comes to robust and reliable bottle packaging, Caps Cases have got it covered. Hooray! 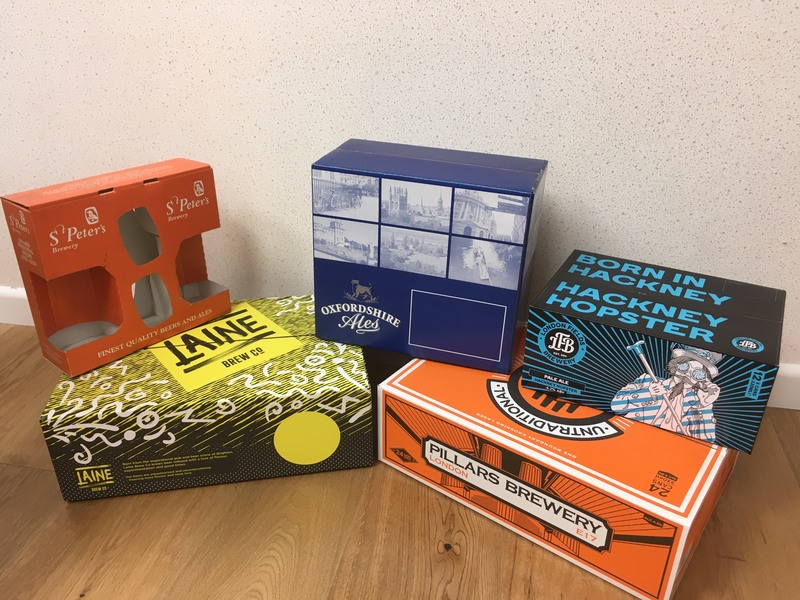 Our custom printed beer and drinks packaging is suitable for a variety of uses, from robust transit packaging through to eye catching display packs. Gift boxes and carry packs: Our high quality print capabilities and in-house design team means we are well placed to provide eye-catching retail and gift packaging that helps show your product in the best possible light. 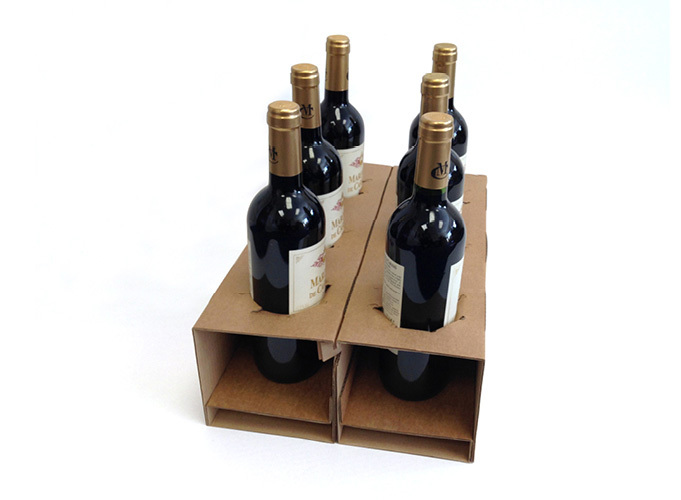 Transit boxes with dividers: We provide 6, 12 and 24 cell bottle cases with dividers to individually house each bottle. The dividers can be supplied fully assembled to make for easy packing. This is a cost-effective way to protect your bottles in transit. We can also make bespoke dividers to suit any case configuration. Courier safe packs: We are proud to be able to offer our patented BottleSafe technology – a courier safe means of transporting drinks. The bottles are suspended within an air space in the outer carton, which is created by top and bottom fittings that securely hold the bottles in place. BottleSafe packaging has been extensively trialled with zero reported breakages. The design is modular meaning we can create 3, 6, 12, 24 bottle packs, without needing bespoke fittings for each configuration. There’s no need for loose fill or bubble wrap and all of BottleSafe’s components fold flat, to minimum storage space required. As with all our products, our bottle packaging is 100% recyclable and can be custom printed to reflect your own design or branding. 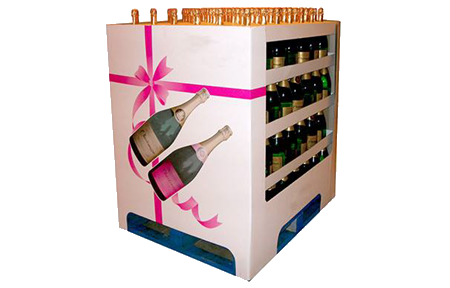 For more information about Caps Cases range of boxes for bottles, or if you’re looking for something bespoke then contact the team today – sales@capscases.co.uk or (01638) 667326. 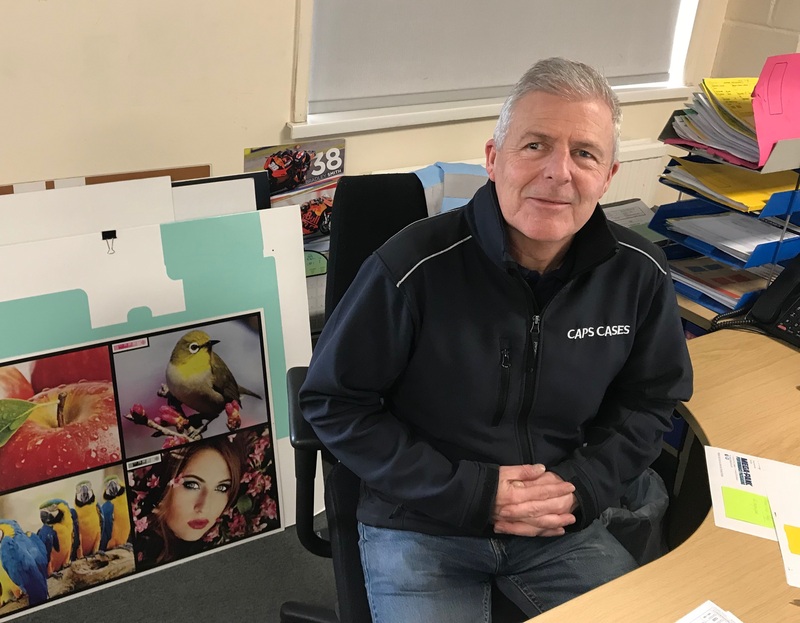 Next month will mark the arrival of Caps Cases’ hotly anticipated five colour flexo casemaker, which is set to boost the company’s manufacturing capabilities. The state-of-the-art machine really does have the ‘wow’ factor; it not only offers five colour flexo print but also features an in-line rotary die-cutter, meaning premium quality print and precision at high speed. The machine is the latest investment by Caps as part of its multi-million pound strategy into technological improvements at the Newmarket site. “This machine is a game changer for Caps Cases,” comments Managing Director Trevor Bissett. Capable of running 8,000 large format cases per hour and with a print tolerance of 0.3mm print registration, the high quality post print (HQPP) machine can genuinely rival litho print quality, but using flexo-graphic techniques. The machine also boasts a vacuum feed throughout, plus infra-red and hot air dryers and an integrated dust extraction system. It is due to be installed at Caps Cases’ Newmarket factory in April. 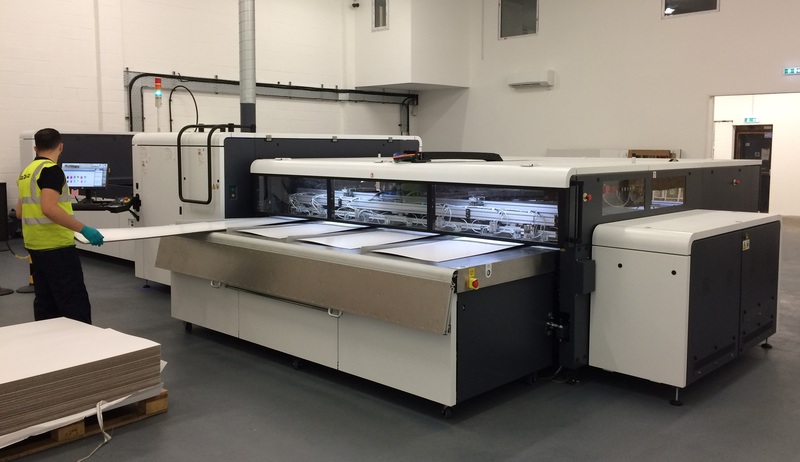 If you would like more information about our new printer or to register for one of the open days, please email info@capscases.co.uk or call us on 01638 667326. Shipping items abroad is a breeze with Caps Cases’ range of robust and hassle-free export-ready pallet boxes. Corrugated cardboard pallet containers are one of the most versatile and reliable packaging solutions on the market, and are ideal for heavy items, export and storage. 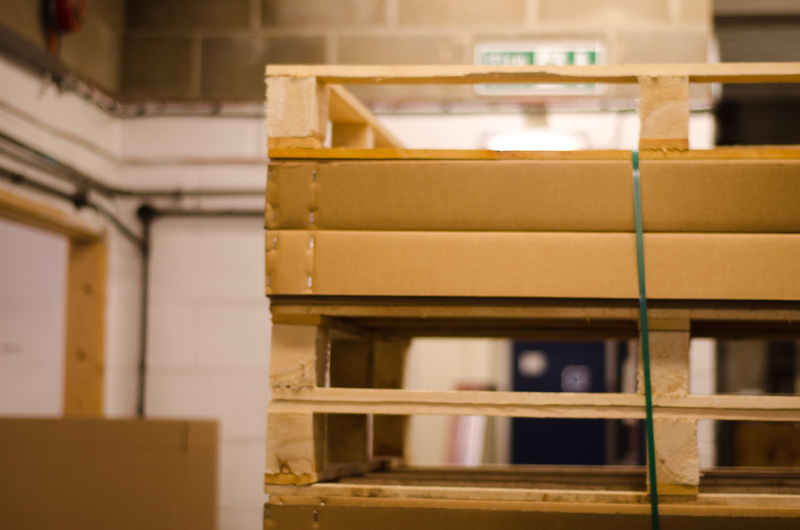 By shipping your products in bulk on pallets, you can not only minimise the cost of packing labour and shipping, but also warehouse storage and disposal costs. As one of only a handful of pallet box manufacturers in the country, Caps Cases stock a range of standard pallet boxes in a Cap, Tray and Sleeve format with or without pallets. We supply the following stock sizes of pallet boxes on a short lead time, but we can also provide bespoke pallet boxes on request, which can be tailored to your individual needs. *All sizes represent the internal size of the sleeve. What’s more, if you are looking to print any corrugated component of the pallet box we can accommodate this for you in up to two colours. Always competitively priced, our pallet boxes are available from both of our manufacturing sites in the UK and can be shipped throughout the UK and into Europe. For more information about our standard size pallet boxes, or if you’re looking to create something bespoke, then please contact our sales team who will be happy to help – sales@capscases.co.uk Tel. 01638 667 326. Here at Caps Cases we’re immensely proud of our hard working team members, some of whom have been with us right from the beginning. At our Newmarket site there are two familiar faces who have been dedicated Caps employees for 34 years. Linda Wilson and Pauline Edwards are a popular double act, who have been joined at the hip since they started working at Caps in 1985. When they’re not busy assembling dividers on the shop floor, they can often be found putting the world to rights in the smoking shelter! As two highly valued members of the team, we caught up with the duo to find out how things have changed at Caps over the years…. How has your job at Caps changed since you started? What have been the biggest changes you have seen during your time at Caps? What’s your funniest memory of your time at Caps? A special thanks to Pauline and Linda – here’s to many more years at Caps Cases! Millions of books, journals and maps from 600 years of collecting are being stored in pristine condition at Cambridge University’s new Library Storage Facility (LSF) thanks to Caps Cases. 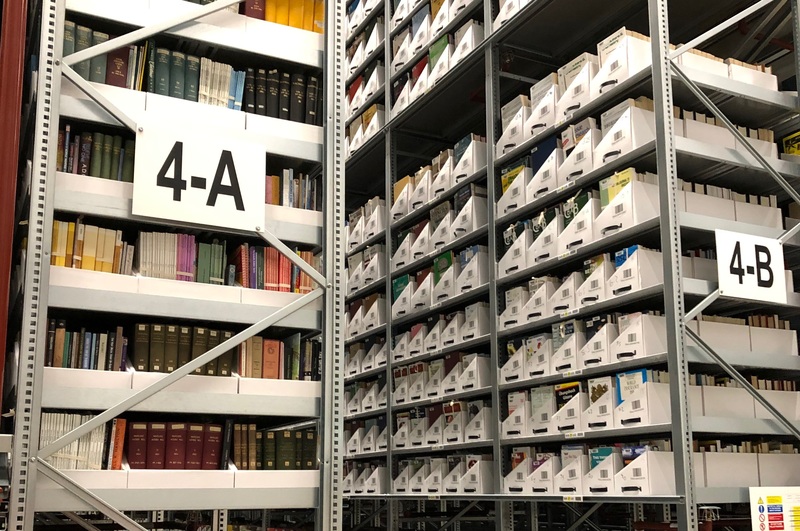 The £17m facility, which was officially opened last summer, has been built to provide a perfect, climate-controlled environment across 65 miles of shelving for its least requested books – those deemed low use. As part of this, the University required acid-free cardboard trays in which to store the valuable materials. Specialists in the design and production of long life packaging products, Caps Cases were delighted to help with the prestigious project, having already successfully worked on a similar project for the University of Oxford. “We were approached by the University to supply bespoke PH neutral paper-lined trays, which would be used to store a vast collection of extremely valuable books and journals – some of which are one of a kind,” explains Commercial Director, Jamie Bissett. Long life packaging is an essential part of the transport and storing process, particularly where the protection of the items being stored is paramount. Ordinary cardboard is not PH neutral, which over time means harmful substances can ingress into the product being stored within and cause it to deteriorate. This can be of particular concern where the items being stored are extremely valuable. Caps Cases can produce packaging from a PH neutral set of paper cardboard material so that products in direct contact with the cardboard will not deteriorate. “We are delighted to have worked in partnership with Caps Cases to deliver this major project to successful completion and at the high quality of their products and services they provided to meet our specialised requirements,” commented Patricia Killiard, Deputy Director, Academic Services, Cambridge University Library. Once all material currently in temporary stores is ingested, the LSF will be 25 per cent full. This is expected to be completed this summer. 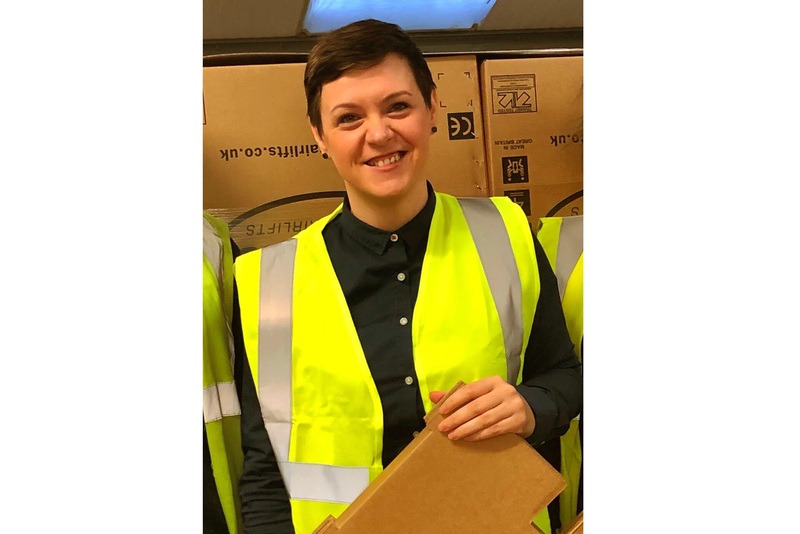 Spotlight on Joanna Szewczyk – Assembly Supervisor and Production Planning Assistant at Caps Cases in Baillieston. We recently caught up with Joanna Szewczyk from the Baillieston office, to learn more about her important role within the Caps team. Joanna first joined Caps Cases in 2010 as an agency worker, but became a permanent member of the team in 2011. Her key responsibilities are to oversee the supply chain and production scheduling on a daily basis. This includes, among other things, planning and organising work for assemblers and machine operators, preparing production plans, addressing material issues and monitoring overall team performance. What are your areas of responsibility at Caps Cases? On a daily basis, I am responsible for forecasting demand and plan supply for one of the key accounts in Baillieston. I lead a team of six assemblers/packers, and together we strive to achieve the best results for both the customer and our company. On some occasions, I am also honoured to cover for our wonderful Linda M when she’s off on holiday! I started my career as a Customer Service Representative – for those who know me this will be quite hard to believe! I also ran my own business for two years prior my move to Scotland. Running my own business at the age of 24 was challenging and a bit overwhelming. However, on reflection it helped me to understand different factors and shaped my focus. I like challenges and opportunities. I’m inclined to say that we all stretch the boundaries to see what we can achieve. I’m very proud of our team as they strive to improve their performance all the time. Current working environment and my role allow me to fail (within reason of course), learn from the experience, and gain some interesting insights. In turn, this helps me to develop various skills that are necessary for today’s working environment. The packaging industry is growing fast, and this requires constant changes whether it’s thinking, problem-solving or innovating. To be able to keep up with constant changes, we need to re-think the way we approach tasks and challenges, and my job allows me to do all of that. What’s been your most interesting/funny experience while working at Caps? Finally completing my Honours degree! What a challenge that was. I’m not going to say what’s coming next but watch this space – I just never stop learning! Tell us a bit about what you like to do outside of work? I read a lot… not books though (haha!) mostly publications and journal articles. Recently I started to learn another language, which I think is fun, keeps me busy and I can do it virtually anywhere which is great. “When you change the way you see things, the things you see change.” —Wayne Dyer. “If there is no struggle, there is no progress.” — Frederick Douglass. Any other interesting facts we should know about you? At Caps Cases we love an archive box. From traditional industry standard base and lid boxes to quick assembly products – we can supply them all. But perhaps our favourite of all, and the archive box which reigns supreme is our patented ‘Klikstor’. The Klikstor was originally created by Caps Cases’ (now retired) designer Ken Whitmore back in the late nineties, after we spotted a gap in the market for a quick assembly product. People were frustrated with the amount of time it took to construct the traditional base and lid boxes, so we came up with a solution – and voila! The Klikstor was born. Since then, we have sold approximately eight million Klikstor boxes, so it’s safe to say it’s a tried and tested product, which we’re really proud of. Quick Assembly. The Klikstor retains the strength and quality of the traditional corrugated cardboard storage box but can be assembled in one simple step. Unlike standard archive boxes that take around 15 seconds to erect, the Klikstor archive box is put together in an instant, saving labour time and cost. Strength and Durability. 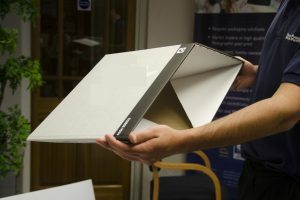 The Klikstor is manufactured with a double layer of cardboard around all four internal walls and has a unique self-locking double layered base, which makes it is stronger and more durable than normal archive boxes. This in turn improves stacking and storing without crushing. Collapsible, Re-Useable and Recyclable. Klikstor archive boxes fold flat in seconds, and can be used time and time again. All of our archive boxes can be printed using up to three colours using high quality flexographic printing to create a design of your choice. With manufacturing facilities in Suffolk and Glasgow we can ensure your corrugated cardboard archive boxes are delivered quickly – and competitively – throughout the UK. Our long established European transport networks mean we can also be a competitive source of corrugated boxes for mainland Europe. 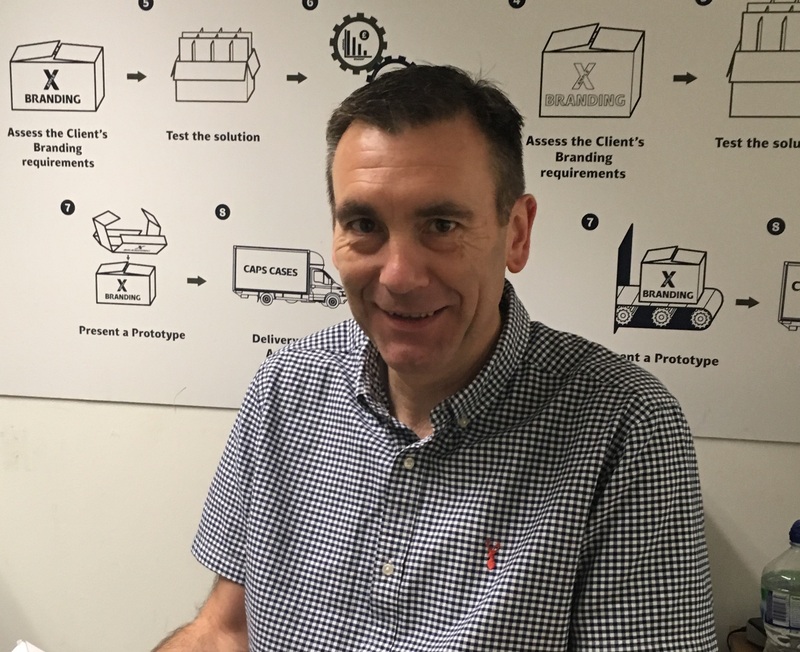 Continuing our ‘Behind The Box’ series, we’re turning the spotlight on Caps Cases’ very own ‘Print Guru’ – Wayne Booker. Wayne has been the Print Manager at Caps since 2000. He oversees the flexo and digital print production and is also responsible for the print quality control. Tell us a bit about your career in the packaging industry. I began my career in packaging way back in 1978 when I joined the Cundell Corrugated Group working on a Simon Hooper two colour letterpress machine where the print plates had to be stapled to the wooden print cylinder! I enjoy pushing the boundaries of what is achievable flexo. What has been your proudest achievement during your time at Caps Cases? My proudest moment was when Charlie (Caps’ Founder and Chairman) told me that Caps were in the fourth division but my focus on print development had taken them to the premier league. What is your work ethos? You are only as good as your last job. Quality must come first. What are the biggest changes in print production that you have seen during your career? The most notable changes have been in machine construction and digital and flexo plate making, as well as major improvements in ink quality. To achieve the best print results, what ingredients are required? There are three key ingredients; good quality flat board, an experienced operator and artwork fit for flexo. How do you see the future of print on corrugated? 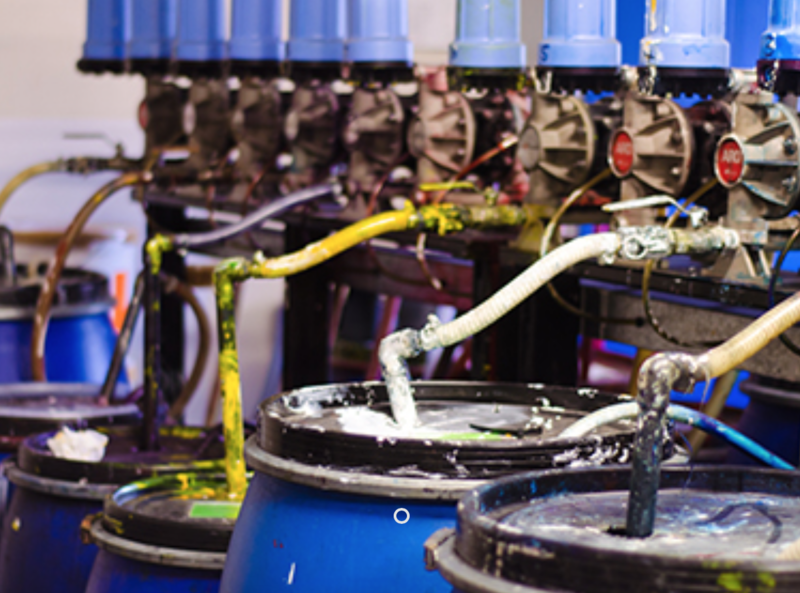 I think that high speed water-based digital printers will become more accessible within the next five years, which will raise the question ‘why go flexo?’ when looking to purchase new equipment. My tag line is ‘Keeping Flexo Alive’ but we will all have to accept that digital printing on corrugated is the future. Any other interesting facts we should know about? One of our prints has been sent to Kodak’s head office in New York for appraisal. My main hobby is motorcycling. I have owned many bikes in my time, with the latest being a Suzuki GSXR1000 K4 capable of 185mph. Calling all e-commerce traders! Whether you’re shipping one package a day or even hundreds, take a moment to think about your packing routine… do you grab a box, put your product in, add some paper or bubble wrap to fill the empty spaces, seal the box and then ship it? Consider this, is that extra filling material really necessary? If you’re just using it to fill the space between the product and the box then would a smaller box make more sense? Today’s savvy retailers can save valuable time, money and even the environment by ensuring that e-commerce packaging is sized correctly to fit the product. One size no longer fits all. In fact, using right size packaging reduces both operational and e-commerce shipping costs by saving storage space, reducing additional packing costs (loose fill and void fill like chips and air pillows), cutting labour costs and significantly reducing assembly and packing times. Right size e-commerce packaging solutions can significantly reduce product movement, helping to reduce damage in transit. Here’s where Caps Cases can help. We specialise in designing and producing premium quality packaging solutions that are both easy for the customer to open and also promote your brand image. We understand how important it is to ensure that your products reach their destination undamaged and in a safe a secure manner, which is why are boxes are bespoke designed to suit your individual requirements and are thoroughly tested before leaving the factory. Like it or loathe it, e-commerce is big business. In the UK, online shopping represents 18% of total retail sales, and that percentage is growing year on year. But did you know it is estimated that a whopping 30% of all goods ordered online are returned? That’s around £7 billion of purchases that are returned each year. With this in mind, Caps Cases has developed a range of e-commerce boxes that are designed to provide the consumer with the option of resealing the box and returning it to the sender, with minimal fuss. Our ‘hassle-free’ packaging is designed to suit your individual requirements and can be printed on the outside of the box, the inside, or both, depending on your preferences. Our dedicated retail packaging design team can create innovative packaging ideas that provide new ways to protect your products in transit and to present them perfectly to the consumer. Whether you are looking for returnable packaging solutions or a new way to promote your brand using flexographic or digital printing, Caps Cases are here to help you create frustration-free solutions for a positive consumer experience. Did you know that around 70% of in-store purchases are made on impulse? In the busy retail environment, an eye-catching Point-Of-Sale (POS) display could be the nudge that your customers need to make their purchasing decision. Cardboard POS units are a cost effective and environmentally friendly way of showcasing your products. Caps Cases are industry leaders in the production of corrugated cardboard POS display units. With a wealth of design experience under our belt, we are experts in delivering stand-out POS units that will set your products apart. If you’re looking to develop a POS campaign, our in-house team of structural designers will guide you through the design process from start to finish. Our state-of-the-art digital and production CAD table allows us to produce complex bespoke FSDUs (Floor Standing Display Units) with no set up charges. We can also offer split print runs for multiple designs if required. Sampling and transit testing is also available. In terms of delivery, we can send the units flat-packed or pre-assembled and in some cases we are able to offer a pre-filled service, depending on the products. Our purpose built digital suite can create all manner of cardboard POS and POP (Point of Purchase) units, FSDUs, Off Fixture Displays (OFDs), Dump bins, Counter Top Displays units (CDUs), In-store Pallet size display bins and Standees and Retail Ready Packaging to name but a few! Every month we’ll be getting to know a different member of the Caps Cases team and looking ‘behind the box’ to see what really makes them tick. Today we’re turning the spotlight on Tommy Allardyce, Operations Manager at Caps Cases Glasgow site. Tommy joined the Caps team in January this year. He is responsible for the day-to-day operational delivery across the Glasgow site, including overseeing production, production planning, quality control, people management, health & safety and admin support. • Have you always worked in the packaging industry? Basically yes. At the outset of my career I started working for a family business, Hamilton’s Packaging, before it ended up being part of Mondi Packaging. I had various roles throughout my 19 years in the business including the role of Operations Director for the Scottish Plants. During the nine years prior to joining Caps Cases, I was the General Manager for the Scottish operation of an export packing company. We manufactured wooden cases and packed goods into them for safe export all over the world. I enjoy the variety and the day-to-day challenges that it brings. I also feel a sense of achievement in making things better and the team spirit on site that goes with it. • What’s a typical day in the office for you? Organising production requirements for both shifts and ensuring all the team members have the tools to fulfil their roles in the business. I also deal with any issues that are barriers to effective production, with a key focus on producing quality cases. • What’s the best piece of advice you’ve ever been given? If you believe in it, go for it. • What’s been your most interesting experience while working in the packaging industry? I learned early in my career that the millimetre is king! Otherwise the cases are a bit roomier than expected… don’t worry Trevor, I won’t make that mistake again! I’ve also sent some weird and wonderful things across the planet, things as small as a computer, to things as big as a house, a submarine to the Caribbean and a racing canoe to a desert. • Tell us a bit about what you like to do outside of work? I’m quite sporty, like keeping fit. My main hobby is running, half marathons and the occasional full marathon, and I’ve been a pace-maker for some local 10k events. I’m a coach at Jog Scotland and get huge satisfaction helping people achieve their goals, and in many instances getting them to a level they never thought possible for themselves. I also play golf (badly). Aside from sport, my wife and I like our holidays – the world is a big place. I enjoy a nice red wine and the odd tasty Caribbean Rum. • Any other interesting facts we should know about you? An interesting unknown fact is that I’ve had dinner with Terry Waite, after his release from Beirut. Digital print is a fast growing sector in the packaging world. Here at Caps Cases, we now produce over 30,000 digitally printed sheets per month – and that figure continues to grow. In a nutshell, digital printing refers to method of printing from a digital-based image directly to a variety of media, i.e. a sheet of cardboard! Digital printing differs from the conventional litho and flexo print processes as it isn’t dependent on the preparation of a separate plate for each print run. All the colours are made up from dots of Cyan, Magenta, Yellow and Black – a commonly used acronym for this is CMYK or 4 colour process set. • With digital printing there are no plate costs. • Late stage customisation of products can be achieved. • The high quality, vibrant print rivals litho-laminate. • Various artworks can be printed at once with no additional tooling costs. • You have the option of spot varnish to highlight logos or match existing items. • There’s also the option of gloss mode for striking results. • Textured finishes can be achieved using layers of ink. However, it’s worth bearing in mind that ink costs of digital printing are higher than other types of printing, and the printers run at a slightly slower speed. Volume production can therefore be slightly more costly. • Flexo printing offers a lower unit cost for volume production. • Odourless, water-based inks are used, which give smooth coverage. • Metallic inks are available. • There are set up costs involved. • Last minute design changes can be costly. We’re happy to work with you to decide on the right packaging and print options for you and your products. If you would like to discuss your requirements with a member of the Caps Cases team we would be delighted to hear from you. You can contact us by email sales@capscases.co.uk or by phone on 01638 667407. It may not sound like a particularly exciting piece of equipment, but in fact the multi-point gluer has a starring role in the Caps Cases production line. This high-speed machine is an essential part of the construction process of one of our most popular products – quick assembly boxes. As the name suggests, these types of boxes are extremely fast to assemble. Whereas a traditional box might take between 10 – 15 seconds to put together, quick assembly boxes take just one or two seconds. Also known as crash lock, quick erect or pop up boxes, quick assembly boxes are strong, robust and durable. They are ideal for die cut style designs, such as Retail Ready or Shelf Ready Packaging, transit boxes, turkey and goose boxes, archive boxes and 4 corner glued trays. If you’re considering changing to quick assembly boxes, it’s worth working out how much time, and in turn money you could save by swapping. For example, if you currently use 5,000 traditional style boxes per week in your factory and it takes on average ten seconds to assemble each box, that’s just under 14 hours of labour per week used for making up boxes. In comparison, if you use the same amount of quick assembly boxes that each take just a second to construct, that’s just under 1.5 hours of labour per week, therefore saving you around 12 hours of labour time each week. Check out our demonstration video to see just how much time can be saved by using quick assembly boxes as opposed to traditional style boxes. Caps Cases have three multi-point gluer machines; three at the Newmarket site and one at the Glasgow site, so we are well equipped to meet the nationwide demand for quick assembly boxes. We also offer a competitively priced glue-only service for trade customers. For more information on quick assembly boxes or any of our other products, please contact the team by email sales@capscases.co.uk or by phone on 01638 667326. Caps Cases has recorded its biggest year to date for sales of cardboard divisions. The company has manufactured 4.5 million division sets in the last 12 months, up six per cent on its previous record figures. Assembled corrugated and solid board divisions are a core product in the Caps Cases portfolio, and we are among the largest producers of divisions in the UK. “We’ve seen year on year growth in the sales of division sets, but this year’s figures have really raised the bar,” comments Managing Director Trevor Bissett. Packaging divisions, also known as box partitions, dividers or separators are the simplest way to provide cushioning when transporting bottles, glassware, ceramics and other delicate goods. They minimise damage and breakages, enabling products to arrive in pristine condition. Corrugated divisions protect through cushioning the products. They offer maximum protection but take up more space within the case and also on pallets. Solid board divisions protect by remaining tight and restricting the movement of the product during transit. Common sizes for bottle packs are available and we also offer bespoke sizes. Generally we can offer both types of divisions without the need for expensive cutting tools due to our specialist equipment. Outer packaging can be designed alongside divisions for optimum product protection. The divisions can be supplied assembled or non-assembled with a maximum lead time of two weeks. We do not have a minimum order quantity. We can produce low volumes if required, but we do offer cost-effective minimum order quantities which are determined by board price breaks. If in doubt, you can ask us to quote for the minimum quantity and the next price break. 2. What are your lead times? This is dependent on the box design but generally we offer 7 – 10 working days lead times for conventional cases and 10 – 15 working days lead times for printed die cut items. 3. I have a product and I need a box for it. Can you help? – What is the product? – How much does it weigh? – How many products per box? – Approximate quantity of boxes? – Are you looking for transit, gift or retail packaging? – How will it be transported? i.e. by courier, post or bulk packed on pallets? – Would you like brown or white cardboard? If white, would you prefer gloss or matte finish? – Do you require the box to be printed? 4. What printing options are available? – Flexographic: Colour print ranging from basic one colour print for logos and text to complex three colour images. – Digital printing: Vibrant and photographic quality images, ideally suited to lower volume orders. It is worth noting that digital printing can have imitations on fine text. 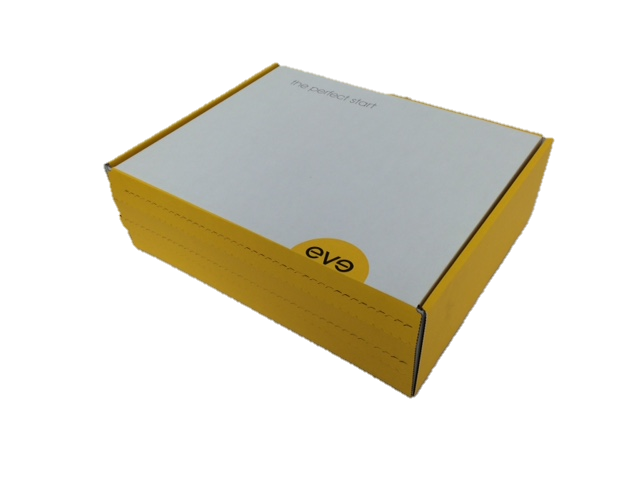 *Don’t forget that we can print the inside and outside of your box for maximum impact! 5. What is ‘Price Per 1000’? 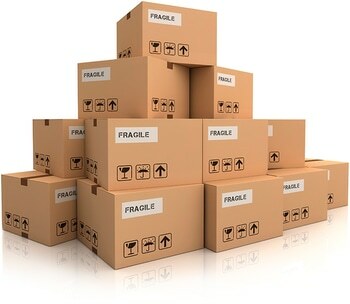 If you have been quoted for 1000 boxes at £650/1000 the easiest way to think of it is as 65p per box. Likewise, if you have a quote for 500 boxes at £450/1000, think of it as 45p per box. 6. What is a ‘Manufacturing Tolerance’? There is an industry-wide standard of +/- 10% tolerance on finished quantities. This is due to the fluctuations in inbound deliveries of raw materials. If you order 1000 boxes, whilst we aim to produce exactly that number, the finished count may fall somewhere between 900 and 1100. But rest assured you will only be invoiced for the amount of boxes that you receive. 7. What is a ‘Cutting Forme’? A cutting forme is a tool needed to cut out bespoke die cut designs from corrugated cardboard. 8. Will my box require a cutting forme? This depends on the style of the box. Some designs can be made on adjustable machinery without the need for cutting forms, but more intricate non-standard designs will require a cutting forme. 9. What are ‘Stereo Costs’? Also often referred to as a ‘printing plate’, a stereo is essentially the stamp that allows us to transfer ink onto the cardboard. They range in price depending on the print coverage and number of colours. 10. Where can you deliver to? We deliver across the UK and into mainland Europe from our production sites In Newmarket and Glasgow. If you have any further questions that haven’t been answered here, then don’t hesitate to get in touch with the team via email sales@capscases.co.uk or by phone on 01638 667326. Caps Cases has strengthened its team of highly skilled designers with the appointment of Silviya Milenova. Silviya brings with her a wealth of experience from her previous roles at design companies, including Omkasan – the leading packaging design company in Turkey. Silviya’s new role as Designer at Caps Cases will see her working closely with the sales department to create bespoke packaging products and prepare prototypes to meet each customer’s unique requirements. 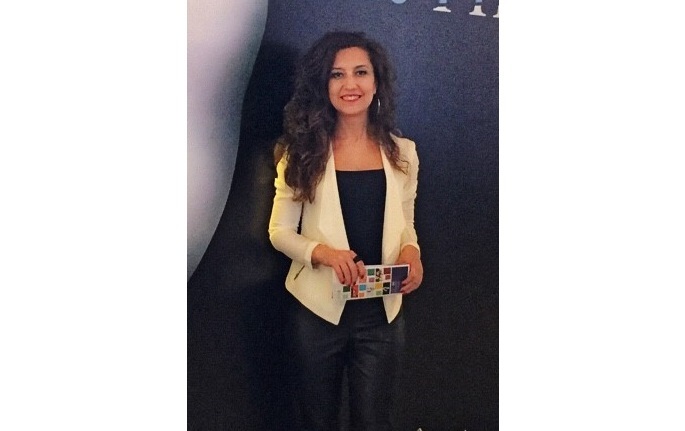 “Being creative and designing new packaging products is the thing I enjoy most about my job,” comments Silviya. Outside of work Silviya enjoys long walks along the river and visiting art museums and exhibitions, but as a former dancer, her real passion is dancing – particularly salsa and the cha-cha. Silviya can also speak four languages – Bulgarian, Russian, Turkish and English. A new high-speed die cutting machine is helping to reduce lead times and increase production capacity here at Caps Cases. By running at more than double the speed of our other die cutters, the new automatic flatbed die cutter has dramatically reduced production time in the factory since it was installed in July. The high-speed precision of the machine means we can offer customers a quicker turnaround time on their die cut orders, while maintaining the premium quality associated with all Caps Cases’ products. 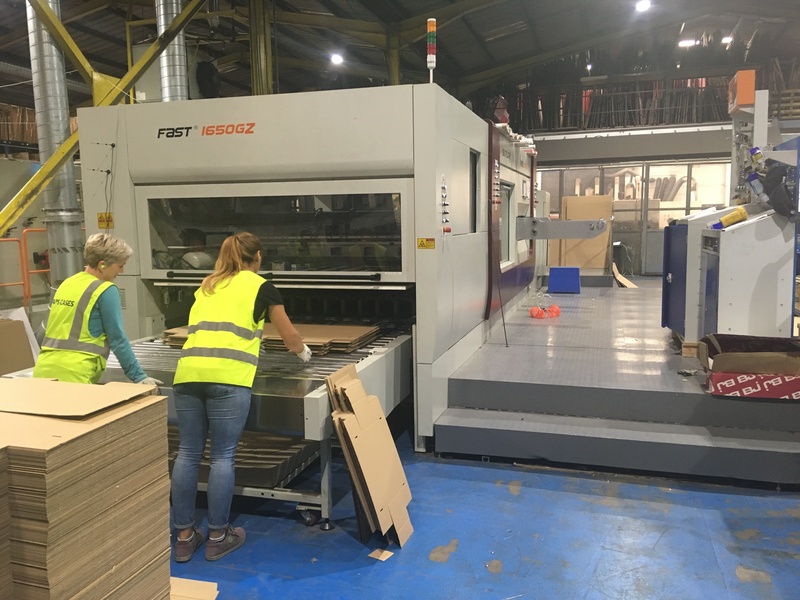 “Our machine operators have undergone a full training programme with the manufacturers of the new die cutter and we are already noticing an improvement in lead times,” comments Production Director Mark Bissett. The new die cutter is used in the production of many of Caps Cases’ premium products including retail ready packaging, high quality printed die cut boxes, drinks packaging, division sets and quick erect cases. Christmas has begun early at Caps Cases this year, as we have already started manufacturing our annual run of premium turkey and goose boxes. Supplying some of the country’s leading fresh poultry distributors, we offer a comprehensive range of bespoke boxes, ideal for the transportation of poultry as well as food and taster hampers. Specifically designed with the packer in mind, the boxes can be quickly and efficiently assembled without the need for tape. Made from high quality double walled cardboard, the boxes feature double base flaps for extra strength, resulting in a highly robust and durable product. The boxes are available in a range of sizes to suit all requirements. They can also be printed with your own bespoke logo or design. 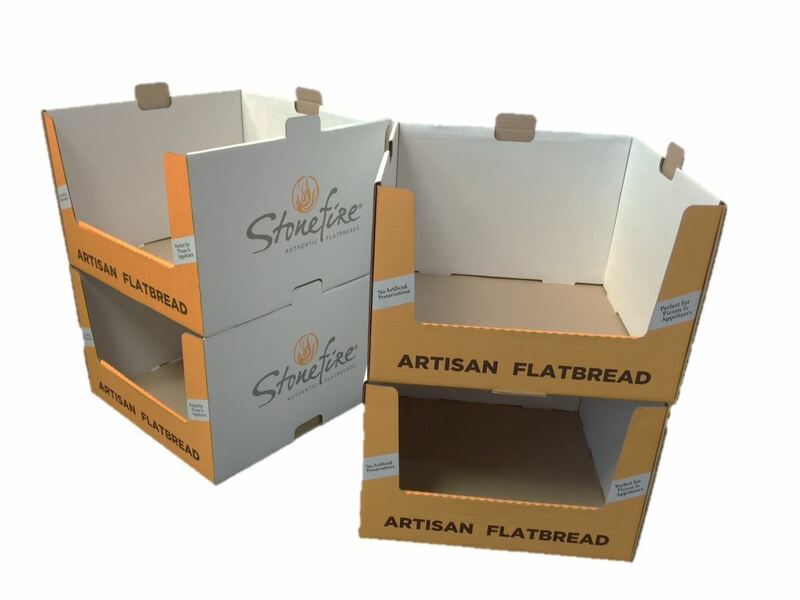 Plain boxes can be ordered in any quantity required. Bespoke print options are available for orders in excess of 500. Click here for more information about the sizes and options we offer, or email michelle@capscases.co.uk to discuss any queries, specific requirements or pricing information. Bespoke Beverage Packaging – We’ll Drink To That! For years here at Caps Cases we have designed and manufactured premium drinks packaging for a number of food and beverage brands. We specialise in high quality ﬂexo printing and have produced some outstanding products for a range of clients. We have worked with some well-known craft breweries including Laine Brew Co who recently had a very speciﬁc design request. Laine wanted to create packaging that would protect their products and enable them to be carried safely, but also wanted the box to have really punchy print that was eye-catching. After discussing their requirements and exactly what they were looking for, our design team got to work to produce some eye catching, high quality printed designs that presented their brand well. Laine were incredibly impressed by how well our design team had captured their requirement. Not only did our packaging design accommodate 24 330ml bottles of their wonderful craft beer, but it presented their brand in an eye-catching and playful way. The job was turned around rapidly in only two weeks and Laine were so pleased that the orders have continued past the ﬁrst remit. We loved working with Laine and continue to welcome new food and beverage clients to speak with our design team. 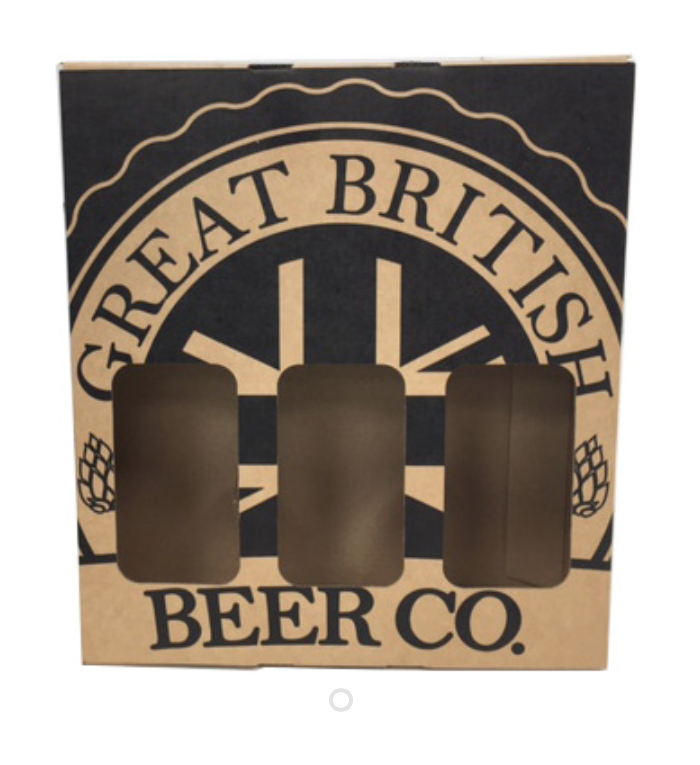 Whether you require drinks packaging for protection, display, carrying or a mixture of all three, we can design and manufacture any requirement you may have. We pride ourselves on our ability to provide a bespoke service whether your order is large or small. We’ve been manufacturing bespoke cardboard packaging since 1982 and continue to do so today in 2018. This is a very special blog post today as we would like to welcome our newest member of staff to the team, Paul Flint. Paul is our new Account Manager here at Caps, responsible for caring for our extremely valued clients. 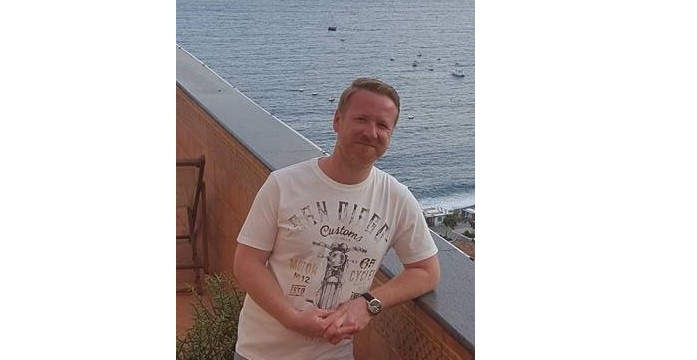 Having spent over 23 years in the industry, initially starting out as a trainee screen printer, Paul has worked with every department of print that you can think of. This includes screen printing, litho assembly work, packing and even stock management. Moreover, Paul has worked with digital print including ﬂatbed and R2R as well as mounting, die-cutting and various aspects of assembly work. It’s fair to say that Paul is well versed in the art of corrugated cardboard! Paul’s top qualities are that he has great attention to detail and a burning desire to understand fully what and with whom he is working on. Paul loves corrugated cardboard so much that when he’s out and about, he cannot help himself from judging shops’ RRP and POS design (much to his wife’s dismay!) Outside of work, Paul is a devoted father to a 4-year-old daughter who he loves nothing more than spending hours in the garden with. He’s a very keen sportsman but prefers to spend his time today watching as opposed to participating. We want to pay a very special welcome to Paul and look forward to working with him on a range of our key accounts. Caps Cases is proud to announce the successful results of its recent BRC assessment. The company achieved a Double A standard at both its Glasgow and Newmarket sites – the highest grade available for this certification. 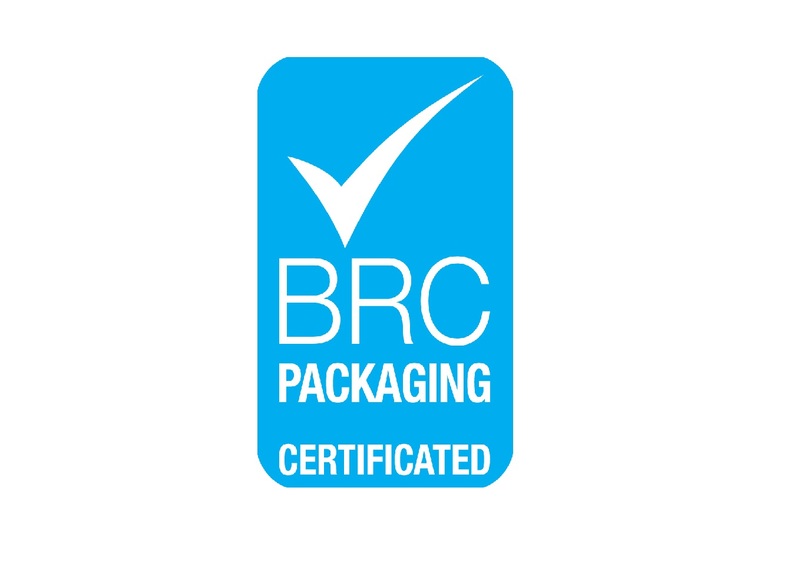 The prestigious BRC standard is globally recognised as the hallmark of a quality packaging manufacturer. In order to achieve the top level, Caps Cases must comply with the strict manufacturing controls set out by the BRC Global Standard for Packaging and Packaging Materials, and undergo a rigorous two-day assessment each year. The achievement means that Caps Cases can supply secondary packaging products to the food industry. The company offers a broad range of food-related packaging products including Shelf Ready Packaging (SRP), transit boxes, turkey and goose boxes and wine, beer and beverage boxes with dividers. We’re all for protecting the environment here at Caps Cases and there’s nothing more exciting than coming across a new product that a) uses cardboard and b) reduces damage to the natural world. Coming across the CasusGrill was a really exciting time for us. Inventors in the US have devised an ingenious BBQ grill made completely out of biodegradable products. Shocked at witnessing the mess left over after people finish with their disposable aluminium BBQs in the summer, the designers felt compelled to create a new, more environmentally friendly product. After much deliberation, the designers chose to use cardboard, bamboo and lava rocks, as if on the odd occasion they were left out, in time they would degrade. The cardboard grill has been designed to create a high, even temperature that ensures all food is grilled properly. It doesn’t require charcoal or lighter fluid making the cardboard grill incredibly light and portable. The grill itself even comes in its own biodegradable packaging bag. 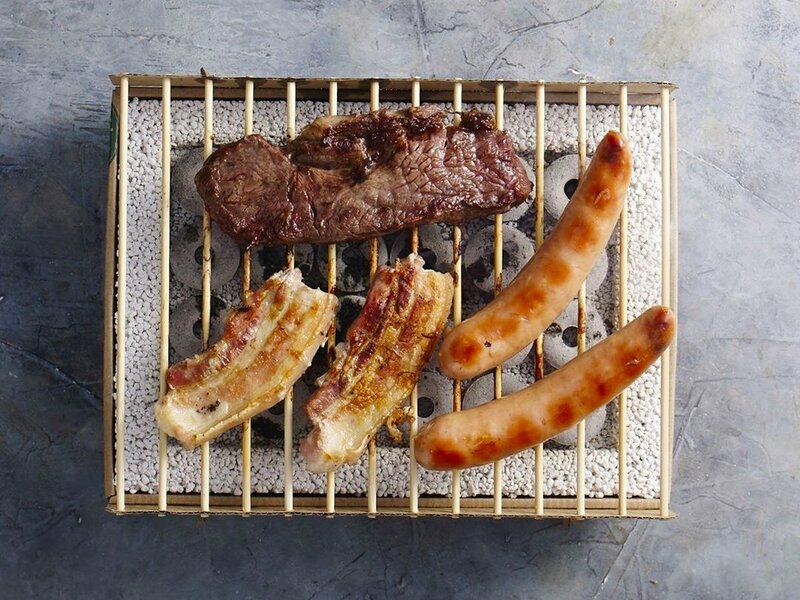 With a total cook time of 60 minutes, the cardboard grill offers a great way to cook BBQ food out and about without damaging the environment. 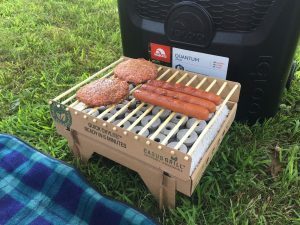 Although the CasusGrill cardboard BBQ is only currently available in the US, it is a testament to the change in social opinion regarding single use, disposable materials. Consumers are no longer happy to damage the environment in order to benefit from the convenience of using something once and throwing it away. Big companies are even starting to change in their approach towards using plastic. The international conglomerate Starbucks have recently vouched to ban plastic straws throughout all of their stores by 2020. We are happy to see companies and consumers alike change their behaviour towards single use plastic. Following on from our recent blog posts documenting the works of Olivier Grossetete, we wanted to showcase examples of the amazing structures that are being built using corrugated cardboard in the Merseyside and Liverpool area. 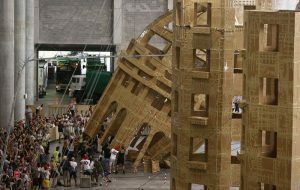 If you haven’t already read our post on how this French designer is creating amazing structures out of corrugated cardboard, then make sure you head over to the news section on our website to find out more. Corrugated cardboard really is a wonder material. It can be used in so many different ways, we just love helping clients’ design and manufacture cardboard products that are intricate and creative. With our in house team of structural designers, we have built a long-lasting reputation based on providing a consultative service and a simple manufacturing process. We’ve made everything from corrugated cardboard products for household name brands in the UK to simple archive boxes that we decided to patent. Don’t get forget to follow us on social media! We post regularly on Twitter, Facebook and LinkedIn. If you want to see a behind the scenes snapshot of what life is like at one of the UK’s largest corrugated cardboard manufacturers, then be sure to follow us. We are also able to carry out a number of design and manufacture services for a range of clients. 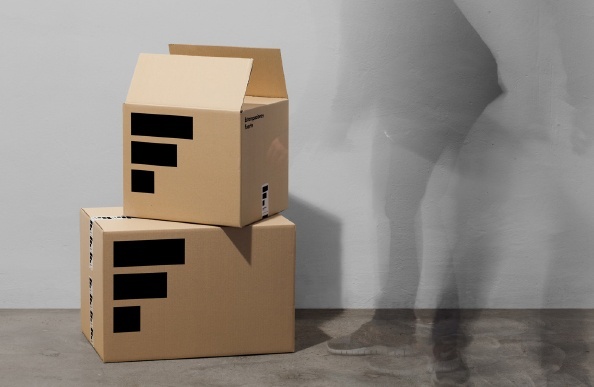 Whether you run an ecommerce brand, have a brick and mortar business or need trade services, we can help bring your packaging ideas to life here at Caps Cases. We’re a family business with over 30 years of experience and pride ourselves on our ability to offer a service with great customer care and flexibility. In part 1 of this blog post, we explore some of our clients’ favourite Caps Cases products. As a trusted provider of POS and Point of Purchase (POP), we have extensive experience in designing and manufacturing attractive and functional displays. We have a skilled team of experience corrugated structural designers that work in house to turn your ideas around quickly and accurately. In our purpose built digital factory, we have the ability to create retail ready POS and POP displays as well as cardboard floor stands, counter top display units, cardboard floor stands and much more. We also have a brand new CAD cutter, which means our clients’ save massively as no costly set up charges are required. As the popularity of ecommerce shopping continues to rise, so does the demand for efficient and durable packaging. We have the ability to design and make ecommerce packaging that is protective and attractive yet will withstand the demands of being transported to consumers and returned. We also produce custom ethical packaging for drinks and beer bottles. Our designs include Bottle Safe Technology and can be made for 3, 6, 12 and 24 multiples. This packaging is perfect for retail and gifts as well as displays, carry packs and transit. We have built a great reputation on delivering retail ready packaging and shelf ready packaging to a number of retail clients in the past. Our design and sales team have extensive experience in delivering products that work, which means looking good but also protecting your goods. A good retail ready packaging design will help to increase brand awareness, reduce packing time and lower transport costs. In this two part blog post, we have explored some of our clients’ favourite products, including those that underpin our strong reputation. 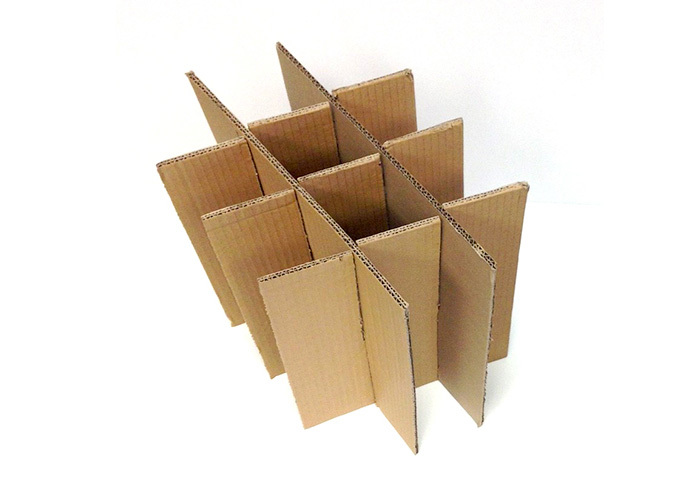 We have delivered a wide range of corrugated cardboard projects and continue to do so today. We offer a range of products and services here at Caps Cases and pride ourselves on our ability to design and manufacture almost anything our clients require. With over 30 years being based at our Newmarket HQ, we have the technological capability and staff expertise to carry out a number of requirements. 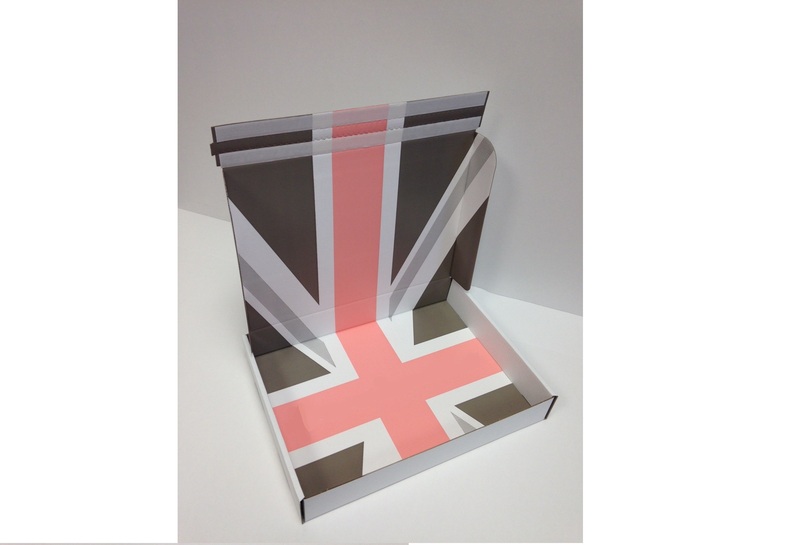 We are the leading manufacturer in the UK for die cut cardboard boxes. Die cutting is a brilliant way to shape boxes that have unique designs or forms. It is an incredibly precise cutting mechanism that provides clean and smooth lines, which are perfect for unusual shapes. We offer a ‘fit for purpose’ approach, meaning that any box that we design and manufacture will not only look great but function perfectly too. Divisions are one of our main specialties that we have the capability to manufacture and deliver from our two sites in the UK. As industry leading producers of divisions, we are able to produce a range of shapes that can be used to insert into boxes for cushioning. Cardboard divisions are a wonderful addition to any corrugated box that is being used to transport delicate goods such as ceramics, bottles and glassware. We offer manufacture wardrobe cartons in two different sizes, which are perfect for packing and transporting clothes and household items. Each box comes complete with a plastic hanging rail, which can be used to maintain the form of your valued clothes. 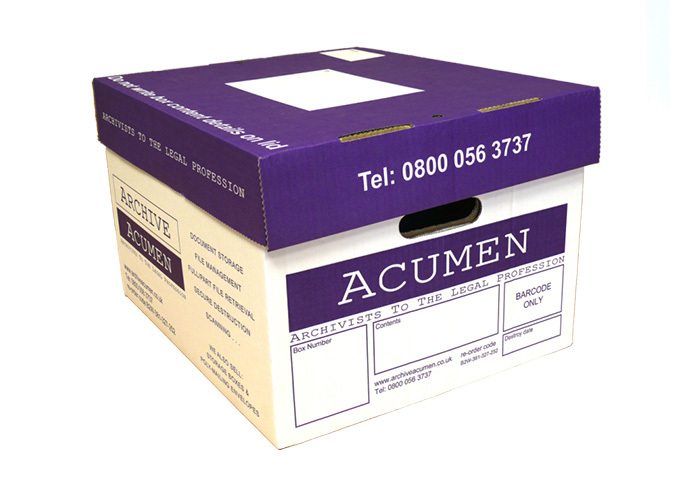 We also serve many of the UK’s top academic institutions by providing state of the art archive boxes. Our archive boxes are sturdy and practical, making them perfect for storing books and paperwork. Although we provide the standard type of archive box that has a standard base and lid, we also offer a quick assemble box as part of our patented ‘Klikstor’ design. Ecommerce is on the rise and with it comes massive pressure being put on the cardboard packaging industry to change with the times. Retailers that trade predominantly online need packaging that is bespoke, environmentally friendly and quick to produce. Moreover, companies are looking to cut costs in anyway possible making packaging design all the more important for goods that need to be posted and shipped efficiently. Many ecommerce retailers seek environmentally friendly packaging for two reasons. Firstly, the war on plastics is a hot topic in 2018 and consumers prefer to buy from companies that have provisions to contribute towards protecting the environment. Secondly, companies using environmentally friendly packaging reduce their carbon footprint and waste, which in turn can often lead to business incentives. The cardboard packaging industry has one of the highest recycling rates out of any other packaging industry. This means that with the rise of ecommerce, more companies will hopefully resort to packaging that preserves the environment as opposed to damaging it. 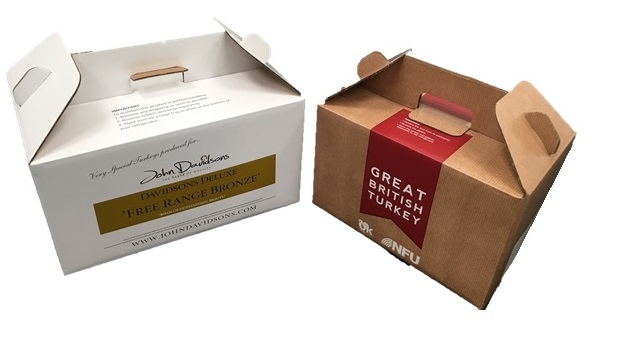 With the rise of ecommerce, packaging manufacturers are being put under pressure to design and make cardboard packaging that is efficient and appropriate but also very specific and bespoke in nature. This can cause issues in automation and systematisation for manufacturers that cannot produce bespoke pieces on a large scale. 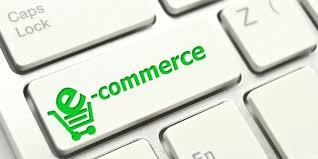 It also means that manufacturers’ design departments must be highly skilled and have enough technology to enable them to provide the specific and unique designs that many ecommerce retailers demand. As ecommerce brands reassess how they package their products due to the pressures put on them by consumers, manufactures are also having to follow suit. This often means that cardboard manufacturers are put under increased pressure to cater for rapidly growing online sales volumes, which in turn demands quicker printing and delivery. We have designed and manufactured a range of different packaging products for the ecommerce market. At Caps Cases, we have the ability to offer a wide range of services to help you bring your packaging dreams to life. Whether its coming up with a design, creating ecommerce packaging, cutting specialist pieces or simply manufacturing a traditional cardboard box, we can help across a range of tasks. We have over 50 years of experience in our design department and pride ourselves on our ability to understand our clients’ needs and bring their ideas to life. Whether its configuring existing FEFCO styles to match your specific requirements or creating bespoke designs based on your needs, we are able to offer a high quality service carried out by a renowned team of structural designers. We are capable of offering a range of print services to guarantee that you convey your brand message as clearly as possible on your product packaging. 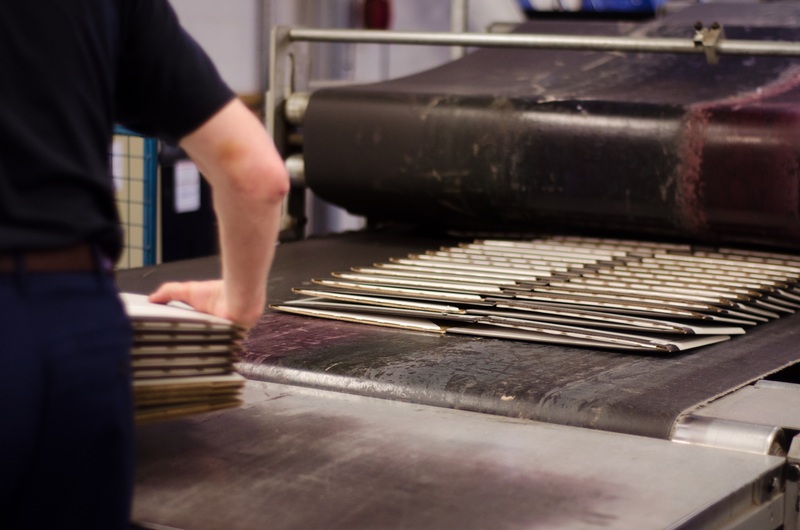 We invest heavily in new print technology and have honed our cutting edge processes, helping us become leaders in the High Quality Post Print (HQPP) sector. Not all cardboard packaging is suitable for transporting valuable goods. Due to the ph level in normal cardboard, oftentimes harmful substances can permeate through normal board and into the product inside, if it is stored for long periods of time. We are able to produce ph neutral cardboard packaging, which is perfect for storing products such as expensive artwork and books for long periods of time. We have built our business successfully by offering trade services to other cardboard manufacturers. With our two sites in the UK and our trustworthy reputation, there is rarely an order we cannot fulfil. We’ve focussed a lot recently on plastic and the global pollution crisis. Plastic pollution awareness is at its highest in the current climate. Companies are reducing their single use plastic waste, campaigns are being run to raise awareness to go plastic free and there are even whole financial districts pledging to reduce their plastic consumption around the world. 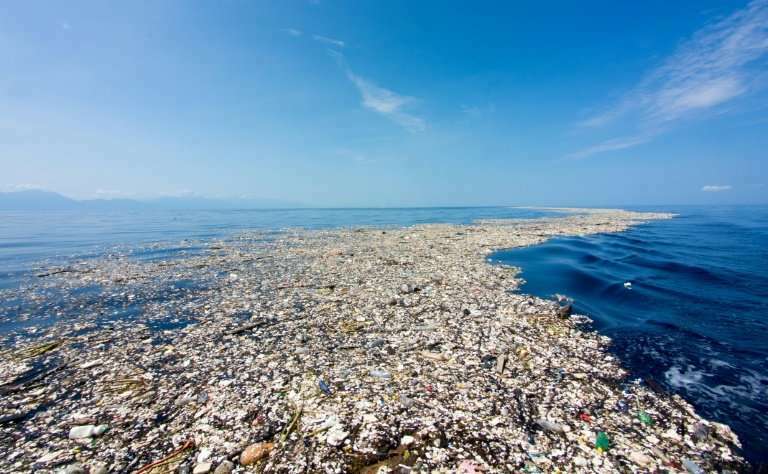 In this blog post we list some of the craziest facts that exist today about plastic. Let us know which one shocks you the most! Only 25% of those bottles are recycled! We find these facts incredibly shocking and hope that they remind people to recycle better and avoid single use plastics. 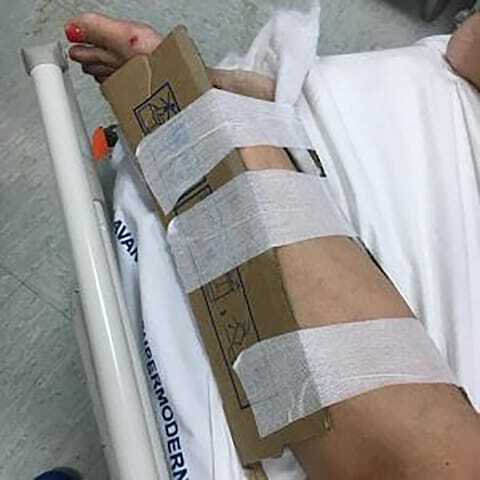 It has been reported that doctors in one region in Italy are resorting to using makeshift cardboard casts for broken bones due to budget cuts and financial deficits. There has been outcry from the general public as oftentimes patients who arrive in A and E after 8pm are told they can only be offered a cardboard cast and that they must come back in the morning to see a doctor. Numerous cardboard casts have been photographed by patients over the last few months. It is a testament to the strain being put on the healthcare system in Italy. The Calabria region healthcare service was designed to manage a catchment area of approximately 200,000 people but now population figures have risen to over 750,000. Despite the Calabria region being the poorest area in Italy, doctors are incredulous to the claims and have called emergency staff meetings to discover what has been going on. We’ve witnessed a number of novel creations using cardboard. In our blog post on IKEA, we explored the company’s new app that encourages kids to play with cardboard. 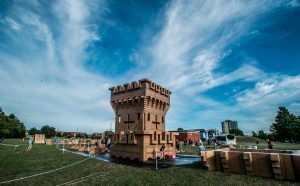 Moreover, we’ve looked at the amazing feats of cardboard architecture in our blog post about Olivier Grosstette and the incredible cardboard boat races of Cambridge and New York. Over the 30 plus years that we have been in operation, we have designed and manufactured a number of different cardboard packaging designs for our valued clients. From hat boxes for Fortnum & Mason to ecommerce packaging and more, we have the capability at Caps to bring your cardboard packaging dreams to life. 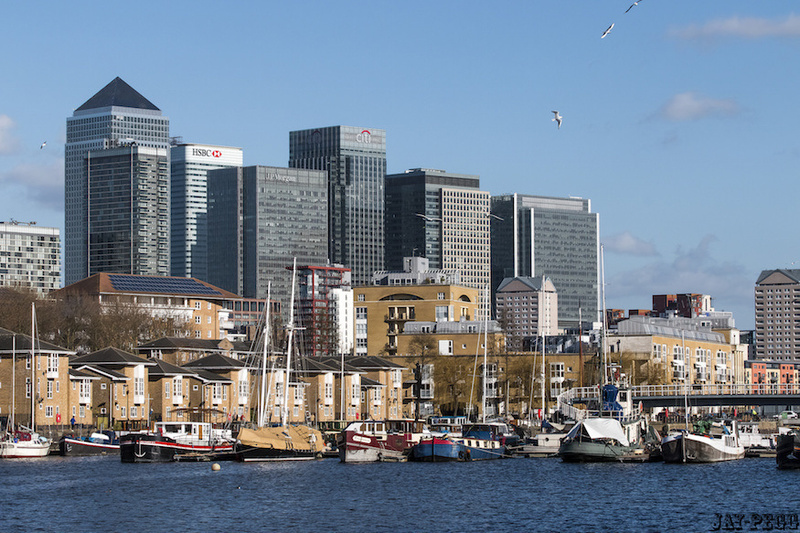 News has recently been released that Canary Wharf, the internationally renowned business district in the UK’s capital has set a target to become the first ever plastic-free commercial centre. 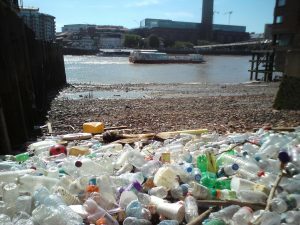 In partnership with the Surfers Against Sewage (SAS) campaign, the Canary Wharf Group have carried out an audit of retailers and businesses in the area and revealed that 94% of the research group are keen to reduce their plastic waste. The Canary Wharf Group are taking a leap of faith as this is the first ever campaign of this kind that has been pledged covering such a large geographical area. There are a number of retailers and businesses in the Canary Wharf region but research has shown that consumer awareness of single use plastic is at an all time high. It is believed that 84% of consumers would show greater loyalty to a brand if they have a clear stance on reducing single use plastic waste. How Do they Plan to Do This? The Canary Wharf group realise that it is going to be a big challenge to get all local businesses on board, especially when dealing with international conglomerates. However, they plan to first tackle the waste created through single use plastic food packaging as well as installing more recycling bins with better signage. The Canary Wharf Group plan to create a movement and hope that other financial centres around the world will follow suit. We hope that other similar groups do the same as the plastic crisis still continues to cause issues around the world. It’s a scary thought to know that almost every single piece of plastic ever that has been created still remains today. 500 million plastic straws are used every day in the US alone and unless we continue to change our behaviour and use of plastic, the situation will continue to get worse. The British summertime culminates in the end of a number of outdoor music festivals that scatter the country. Friends, dancing, drinks and great music draw crowds of hundreds of thousands of festival goers to rural areas all around the UK. What is often overlooked with music festivals is the amount of waste that is produced. Drinks are served in single use plastic cups, food comes with plastic forks and there are thousands of freebies and products being sold in plastic bags. 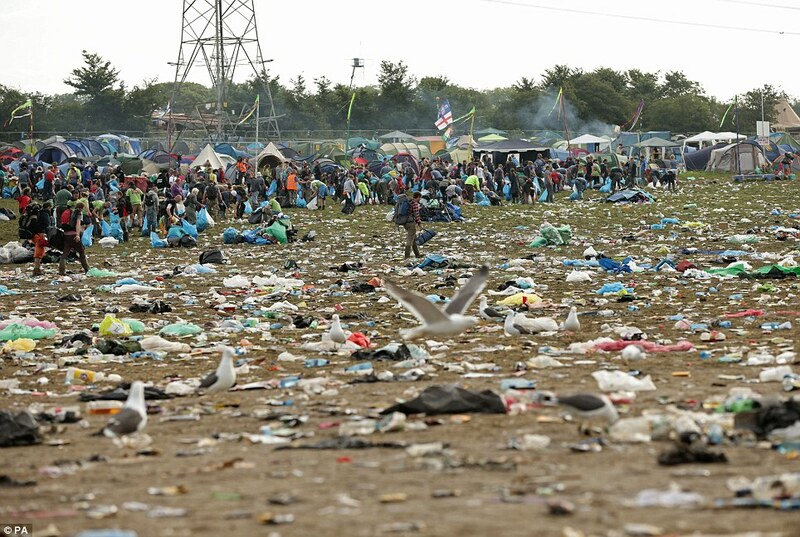 In fact, it is estimated that approximately 23,000 tons of waste is produced in the UK from music festivals every year. Worst of all, only a third of this waste is recycled. This year, 61 independent music event organisers have signed a pledge to get ‘Drastic on Plastic’. This three year pledge means that event organisers agree to get rid of single-use plastics on all of their sites by 2021. Festivals operate on incredibly tight margins, as they often involve having to build large stages and buildings from scratch in very rural areas. Therefore, the Drastic on Plastic campaign has set a three year target to realistically give event organisers a chance of removing plastic. The unsightly scene of thousands of empty plastic cups is not the only issue that comes from hosting a large music event. Plastic is often used for straws, cutlery, wristbands, cable ties and even face paint. Some of the largest UK based music events are even on board including Reading and Leeds. These two events have initiated a returned bottle policy that gives £1 to anyone who returns 10 empty bottles or plastic cups. 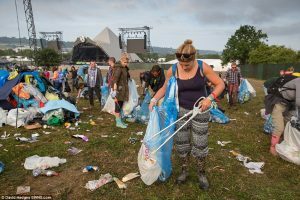 Glastonbury has also joined the movement by promising a site wide plastic ban for there 2019 event. 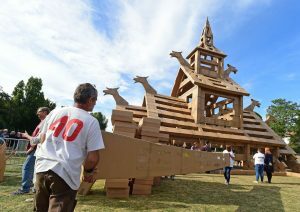 French designer Olivier Grossetete has built a reputation for creating amazing art pieces around the world made solely out of cardboard. 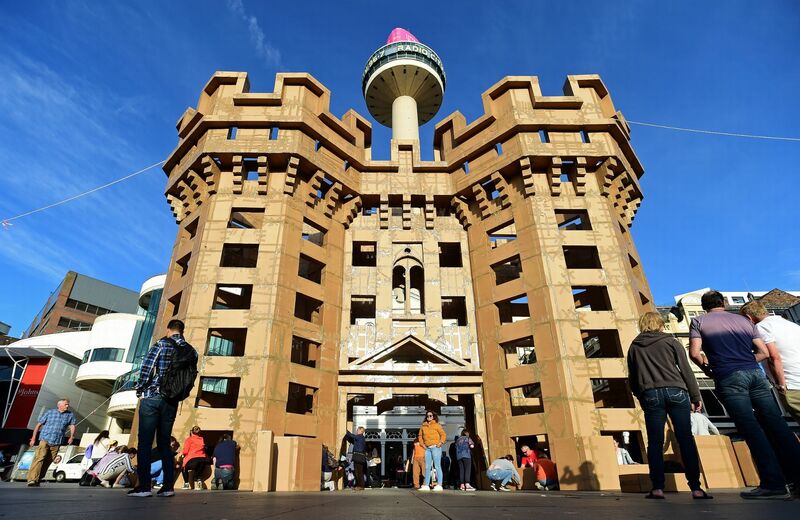 Recently being commissioned to revive Liverpool and Merseyside’s appeal as the cultural capital of the UK, Grossetete produces artwork through creating astonishing feats of cardboard architecture around the world. The designs are reduced to simple parts so that they can be made with basic cardboard boxes. Grossetete also calls upon the local community to get involved with the organising, building and destroying of all of the pieces of art. His work is never completely finished or perfected as he believes strongly that there is no such thing as perfection. The structures are more so a piece of performance art as opposed to stand alone piece, as it is the bringing together of communities and team work that makes each piece special. 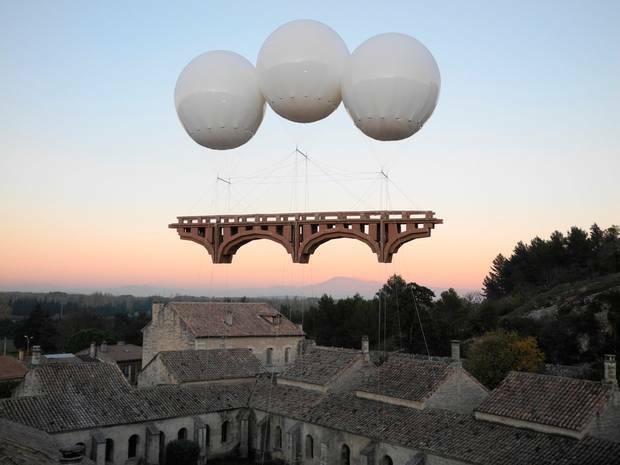 Grossetete has created structures all around the world including a 20 building spectacle in Marseilles and a floating bridge in Avignon. This year Grossetete will be creating two structures in Ireland as part of the Galway Arts Festival. He plans to build one structure in Eyre Square and another on the water, which will involve floating cardboard kayaks and bridges. Despite the risk of water and wind damage, Grossetete remains blasé about the fact that his hard work could be destroyed in a matter of minutes. He believes that art should not be about holding onto one’s own creations but more so to enjoy the energy of working together with other people. We salute Grosstete’s incredible creativity in using cardboard and believe his work is a true testament to how versatile and flexible cardboard is when applied to different needs. We can design and manufacture a range of products here at Caps Cases, so please don’t hesitate to contact us at sales@capscases.co.uk for more information. Cardboard is an incredibly versatile material that can be used for many things such as simple packaging, creative design, VR and much more. 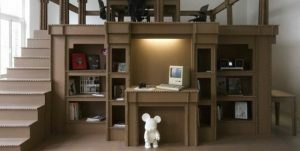 In this article, we explore the amazing things people have built using cardboard. 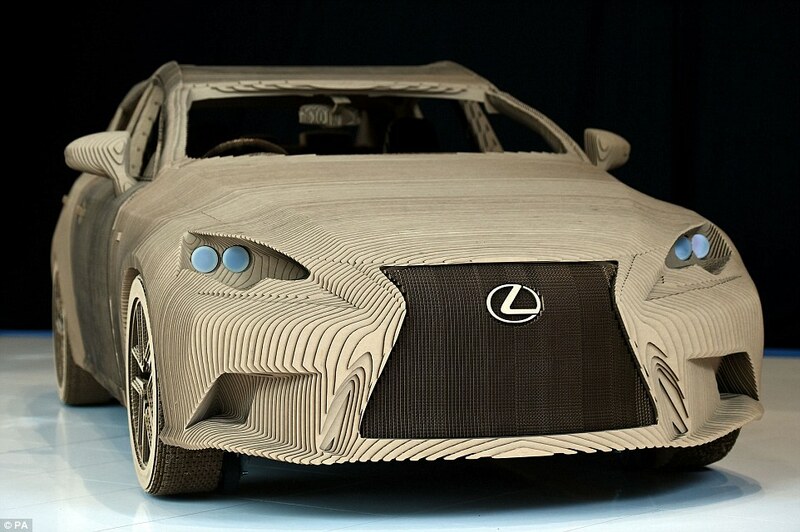 Lexus, the international car company took 3 months to put together a fully functioning cardboard car, constructed out of a total of 1,700 pieces. The carefully cut pieces of cardboard were held together using water based glue and feature a mounted aluminium motor. The car in fact can be driven in an incredibly controlled environment but for obvious reasons has not be made for commercial use! Amsterdam advertising agency Nothing, commissioned two Dutch designers to come up with an office design concept that was innovative yet could be made on a very low budget. After much deliberation, the designers decided to work with corrugated cardboard due to its low cost and durability. What they came up with was a whole office fit out using cardboard, that was both functional and inspiring. Their designs included meeting rooms with windows and doors as well as desks and office furniture. 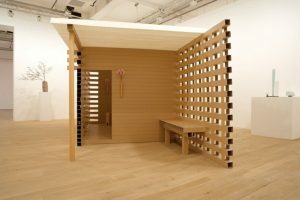 Japanese designer Shigeru Ban designed and created a 5×5 metre house out of cardboard called the Paper Tea House. Inside the house, sits a table, four stools and a bench all neatly arranged into a beautiful work of art. Although the house was designed as an art piece and cannot be installed outside, it is an amazing representation of how versatile and strong cardboard is when used in many different ways. If you’re keen to protect the environment and like to store your cardboard boxes so that they can be reused, there are a number of things you must consider to ensure they are kept safely. Cardboard is highly flammable like paper and must be kept away from any source of intense heat or open flame. As cardboard degrades over time, it can dry out considerably if kept in hot and dry conditions. It is important to monitor the cardboard that is being stored and is always best to avoid storing large, condensed amounts in small storage places. Storing cardboard boxes for a long period of time is a sure fire way to attract nasty bugs and critters that you may not want to welcome into your home. Spiders are one of the main insects that like to nest in dry, dark conditions. However you could be welcoming other insects as well such as cockroaches and bookworms that both love to consume the binding that holds cardboard together. Unless you are storing your cardboard boxes for another reason, it is best to flatten them and take them away for recycling as soon as possible. 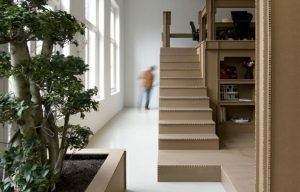 Unless you spend the time to flatten every single cardboard box you want to store, they will take up a large amount of space in your home. This can be a safety issue regarding access to your home but equally it can be a nuisance. 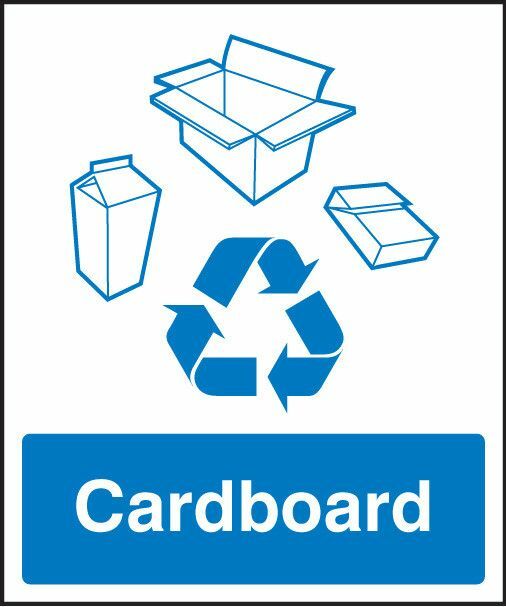 It is normal to save cardboard boxes sometimes, say for example you have a 30 day return guarantee on a new product you have bought, but it is always best in the longterm to flatten them and take them away for recycling. 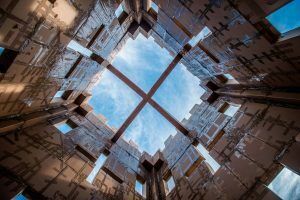 We’ve written a lot lately about recycling cardboard and the plastic crisis that has engulfed our global community. This time, we wanted to lighten the mood by discussing some of the weird and wonderful facts that exist about cardboard. How much cardboard needs to be recycled to save 9 cubic yards of landfill space? 17 trees? 46 gallons of oil? The answer is one tonne of cardboard. If we simply make the effort to collect all of our disposed cardboard and put it into the recycling bin, we can save the need to deplete the world of its natural resources. Unfortunately, not everyone is as diligent as you and I in recycling their used cardboard. In fact, in the United States alone, 850 million tonnes of cardboard and paper are thrown away annually. This horrifically high number equates to a total of 1 billion trees being used and disposed of once. These high numbers show how there is still much room for improvement around the world for everyone to recycle more. The corrugated cardboard industry does still have one of the highest recycling rates of any other packaging industry. 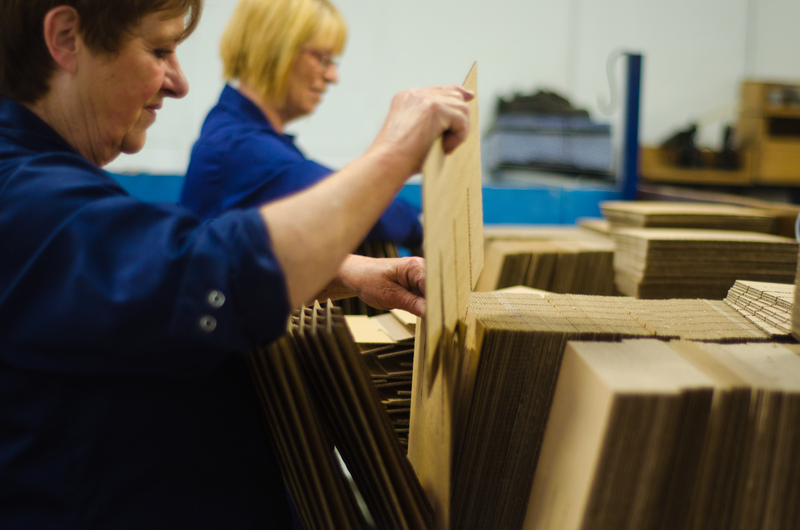 Moreover, the cardboard industry remains strong and growing with a total value of over £4 billion and employing over 27,000 people in the UK alone. We’ve been in the corrugated cardboard industry for over 30 years and can help with any of your manufacturing and design needs. Please contact us at sales@capscases.co.uk for more information. In part 1 of this blog post, we introduced the first steps that are taken to recycle previously used cardboard. If you haven’t read it yet, you can read part 1 here. Once the cardboard has been collected, sorted, shredded and made into pulp, it is then processed through a filtering system that gets rid of all foreign materials and impurities. Often times cardboard boxes are held together by tape, strings or glue, which are important to remove when creating a new cardboard product out of recycled material. The pulp is then pushed into a centrifuge that revolves at a rapid rate, which in turn separates any plastics or metal staples. Once all foreign objects have been removed, the material undergoes a de-inking procedure where it is submerged in a floatation device made of of chemicals that removes any form of ink or dyes. This also cleans the material and prepares it for the final stages. The pulp material after cleaning is then put through a conveyor belt to dry and be heated. When the pulp is dried, it is pushed through an automated machine that squeezes out any residual water and starts to form long rolls of solid cardboard sheet. These sheets are called liner boards which are then glued together layer by layer. The end result is a corrugated cardboard sheet that can be formed to make boxes or other shapes depending on the recycled design. As explained in part 1 of this blog post, we are dedicated to using recycled materials as much as we can here at Caps Cases.